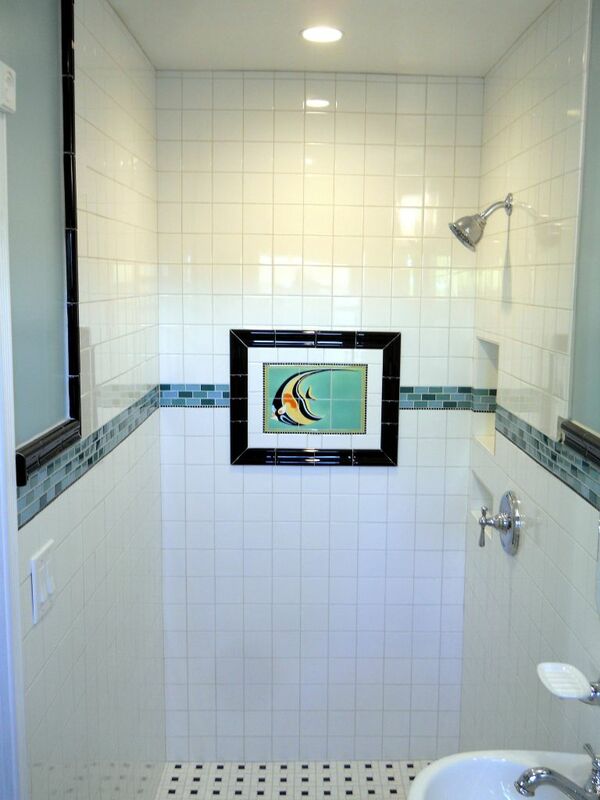 When you live in Southern California it’s essential to make every inch of a small bathroom count….and that’s exactly what Jeff R. accomplished in his recent bath renovation project. 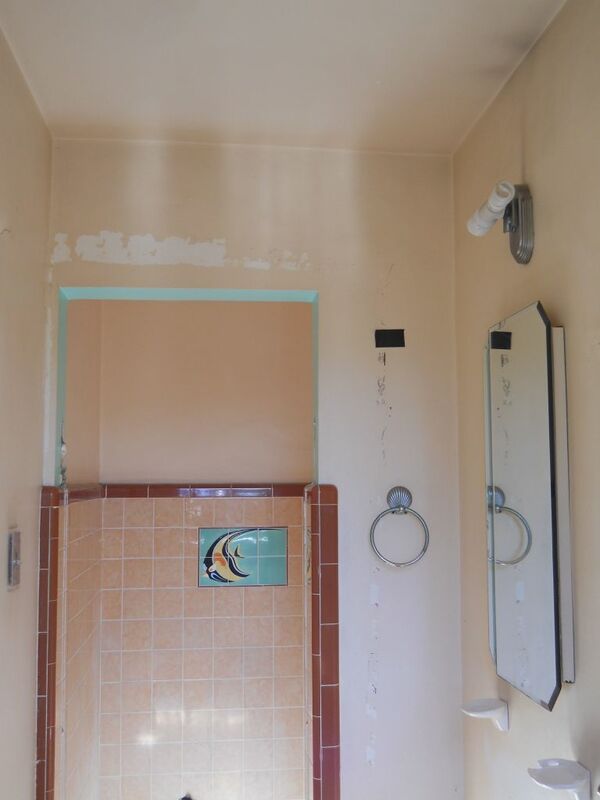 As Jeff said, “The bathroom in our 75 year old home was shot. 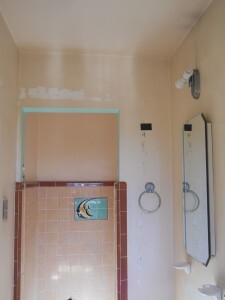 The tile had hairline cracks, the shower area was dark, the shower pan was failing, and the earthquakes and tremors where part of the cause of the tile falling apart.” It was not possible to change the size or layout of this room – so the challenge would be to make the space nicer and more functional…but how? 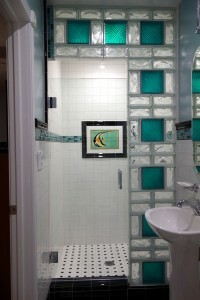 Learn below how Jeff, his wife, an interior designer and their contractor not only used materials like a unique “floating” glass block wall to create a fresh contemporary look – but also embraced a famous tile design element to make their small space sparkle. Choosing the right products for this update was key. Jeff – who has always been a fan of glass blocks was determined to use this material – but was not content to do it in the same old way of just stacking one clear block on top of another. Getting inspiration from unique local projects and the web site of Innovate Building Solutions Jeff designed a “floating” glass block shower – where part of the shower stall literally appears to not be supported and floats above the pivoting glass doorway. One of the interesting features of the old bathroom was a tile mosaic of a fish in the middle of the old shower that is believed to be manufactured from the famous Catalina Tile Company. 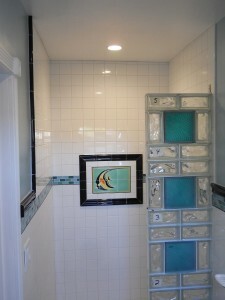 Jeff and his wife not only wanted to retain this design element – but also to decorate the space around this tile section. Their contractor very carefully removed the old tile and reused the design in the middle of the new shower. 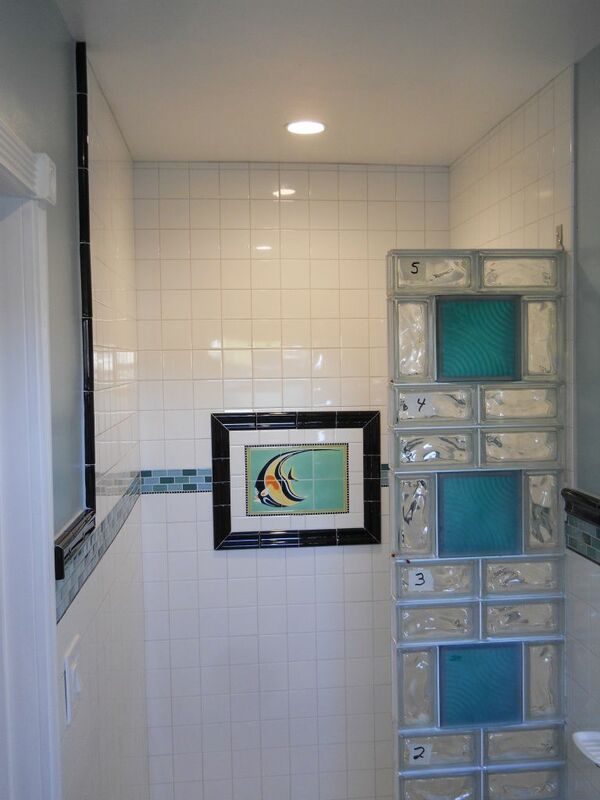 In addition the colors of the glass tile border and colored glass blocks where chosen to highlight the old tile mural – how cool is that! In many cases little things make a big difference in a small shower. Jeff used recessed wall niches premade with expanded polystyrene and plastic for the soap and shampoo to maximize the space on the inside of the shower. 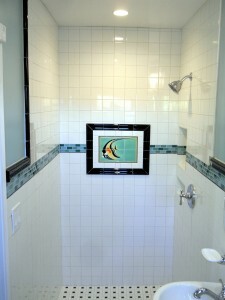 What do you think about this small bathroom renovation? Please comment below. To get free estimate on a glass block shower installation or for nationwide supply of premade sections like were used in this project contact Innovate Building Solutions (877-668-5888) or for a local project their divisions including Columbus Glass Block (614-252-5888), Cleveland Glass Block (216-531-6363), West Side Glass Block (216-398-1020) or Mid America Glass Block (513-742-5900) of Cincinnati or Dayton and Akron (330-633-2900). If you need a small bathroom remodeling project in Northeastern Ohio contact Cleveland Design & Remodeling (216-658-1270). This article was authored by Mike Foti. Wow! What a beautiful job! I wish I had seen this before I remodeled my small bathroom. A true work of art!